Dahua Technology, a leading solution provider in the global video surveillance industry, officially launched its mini PT/PTZ IR IP CCTV cameras, offering a broader suite of professional functions compacted into a smaller size, which makes it easier for instalment, night filming and visual detail capture. Dahua Technology announced the launch of a system of extended Power over Ethernet ( ePoE ) devices including cameras, network switches and network recorders. 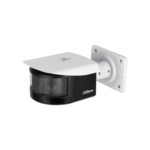 Dahua Technology announces that over 100 different models of Dahua camera have been integrated into ASUSTOR, providing home and enterprise users with a highly secure surveillance solution. Dahua launched an entry-level thermal IP CCTV mini hybrid bullet camera – DH-TPC-BF2120.